San Antonio, Texas—The founders of Guide Dogs of Texas, Inc. had a vision: to fill the void in the south-central part of the country for a guide dog school. They recognized that visually impaired clients previously had to travel 1,200 miles outside of Texas to reach one of the eleven other accredited guide dog schools in the country. The distance was a journey that for many would be nearly impossible. 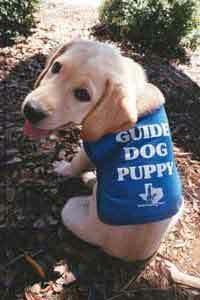 In 1989, Guide Dogs of Texas, Inc. was born, with a mission of instilling independence and mobility into the lives of visually impaired Texans. 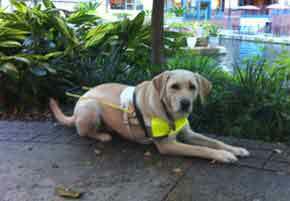 To do so, they hired a guide dog mobility instructor from England, who brought with him an English training model. The model was an individualized approach, which sought to train, place, and follow each client/guide dog team throughout its duration. 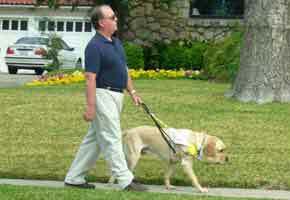 Since the first guide dog mobility instructor arrived, Guide Dogs of Texas, Inc. has placed fifty dogs. But the organization was struggling financially. The board, which was made up of friends of the founders, was relying on special events such as bake sales and golf tournaments to make ends meet. They were only able to employ six staff members, and therefore had to depend on volunteers to accomplish many of their daily goals. That's when Larry Tuttle was called in. Larry had read Terry Axelrod's Raising More Money, and he saw how Benevon could help. "We needed to have the focus to bring the entire organization together around the culture of fundraising," Tuttle says. Within a year, they had formed a team, hired a development director, and attended a Benevon 101 training session. They held two Points of Entry per month, which were geared toward exhibiting their three "buckets" of "raising, training, and providing." Tuttle says each Point of Entry yielded an average of ten to twelve people interested in the cause. Next came the first Ask Event, held in the ballroom of a destination resort in San Antonio, with 240 people in attendance. "Nobody anticipated what was going to come out of it," Tuttle says. What came out of it was $262,000 in cash and pledges, and an additional board member. A woman approached Tuttle who was so taken by the video and the client testimonial at the Ask Event that she asked if it was possible for her to join the board. Tuttle says Benevon has enabled Guide Dogs of Texas, Inc. to contract with a PR marketing specialist and work closely with a new board member who has moved the organization into the realm of social media. "Benevon has propelled us into outreach and public awareness. We're getting a lot more people coming and asking ‘What are you guys about? Can I come to a tour?'" Tuttle says. Guide Dogs of Texas, Inc. also held their first Free Feel-Good Cultivation Event for their Multiple-Year Giving Society donors, a puppy induction for their first litter of Texas-born, guide dog bred puppies. Donors were invited to participate in a naming contest for the pups on Facebook. Some of the winning names included Austin, Alamo, and Aggie. Tuttle says Guide Dogs of Texas, Inc. has a master plan for growth, which includes doubling the number of dogs placed in a year, adding more guide dog mobility instructors to their staff, expanding their facilities, and serving residents from the entire state of Texas. Tuttle says none of those goals would be possible without Benevon. "Having that third-party evaluation is invaluable for our team."